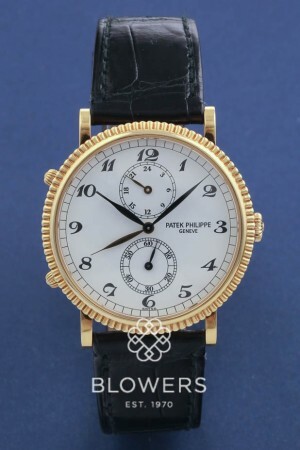 18ct Gold Patek Philippe Calatrava Travel Time 5034J–001. Hand wound 215 PS FUS movement. 34mm case. White dial with black arabic numerals. 60 second and 24 hour sub dials. Black croc strap with gold pin buckle. Box and papers dated May 2004. Our reference S22067. SKU: 3034272. Categories: Calatrava, Patek Philippe.